Robin Redbreast has not been repeated since 1971, and yet is often recalled by viewers of the time, probably because of its eerie atmosphere, and particularly for its horrifying and surreal finale. Indeed, the play has had such a strong impact on those who have seen it, that it is almost seen as an “event” play – a work that came out of the blue, singular in approach and subject matter, and mysterious in genesis. It is because of this, perhaps, that the very limited amount of critical writing on the play has tended to be of the “remember that…what was all that about?” school of criticism. In fact its writer, John Bowen, has well over 50 plays, screenplays and novels to his credit, and Robin Redbreast is just one of many pieces he created that draw from his thematic interest in ancient myths and the way they live on in modern culture. 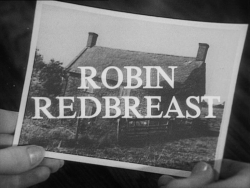 Although Robin Redbreast is a good example of the thriller genre, Bowen was a very (some would say overly) serious writer, and he stressed the importance of ideas in his work: “A play is ideas expressed in incident…a play works first on emotions, but emotion unanchored by thought simply washes about the place in a thoroughly self-indulgent way…”1 The ideas in Robin Redbreast are not obvious at first, but when the play is viewed in the context of Bowen’s other work it becomes less opaque. It is also significant that the play represents the best synthesis of Bowen’s predominant ideas, and seems to have had an impact on the development of his subsequent career. Norah Palmer (Anna Cropper) is a television script editor who has recently been abandoned by her long-term lover. She has taken “custody” of an old cottage, put her job on the back-burner, and plans to rebuild her life. 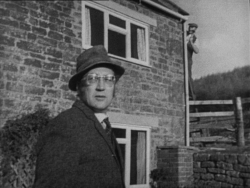 The village consists of standard sinister types, such as Fisher (Bernard Hepton) the local historian, Mrs Vigo (Freda Bamford) the controlling housemaid, and the handsome outsider Rob(in)/Edgar (Andrew Bradford) who Norah finds practising karate half-naked in the local woods. Norah sleeps with Rob, and falls pregnant because her dutch cap has mysteriously vanished. She begins to suspect that the villagers, and particularly Fisher, arranged for this to happen. She returns to London, but cannot bring herself to have an abortion. When she returns to the cottage, she is prevented from leaving before Easter Sunday (her car is sabotaged and phone disconnected) and becomes convinced that she is going to be sacrificed. In the event, the villagers have been planning to sacrifice Rob, and indeed have nurtured him for this fate for the whole of his life. 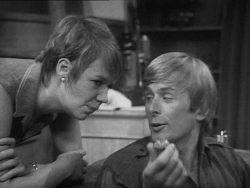 Norah passes out before Rob is sacrificed (dismembered by axe), and is firmly told by Fisher the next day that no-one would believe her if she tries to tell the police. He also offers to take her baby from her so that they can nurture it as the “new” Robin. Norah refuses and is allowed to depart from the village, only to see when she looks back that the villagers have transformed into their pagan equivalents with Fisher as Herne the Hunter complete with antlers. This kind of behind-the-scenes activity was wearily familiar to Bowen, who had been known in the early part of his career for his satirical novels about the media world and the people that moved within it. But the fact that it was commissioned and written as a genre piece is significant, and it may not have had such an impact if it had been shown in a season of plays of an equivalent genre as originally planned. In addition, the atmosphere would surely have been enhanced for contemporary audiences by the play being transmitted on a dark winter’s evening just before Christmas 1970, although this was somewhat spoiled by an electrician’s work to rule which prevented the play being transmitted to all regions. 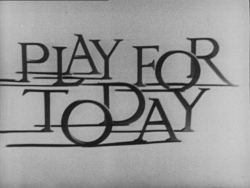 The disappointed viewers (and those eager to see the play again) were placated with a quick repeat showing the following February, making this the first Play for Today to be repeated. For all the unusual circumstances behind the play’s genesis, there are other reasons why it remains powerful, despite featuring a basic plot that has been used in one guise or another from The Wicker Man to Children of the Corn. It primarily works well because it pulls off some effective variations on the usual village conspiracy theme. My favourite tactic is that Bowen continually has the villagers telling Norah what is going on. When she notices that a drainpipe has been pulled away from her house Fisher replies: “I should say it was somebody on your roof”. She draws Mrs. Vigo’s attention to the same thing and she merely comments: “Careless”. And Fisher caps it all by responding to Norah’s suggestion that her car has been sabotaged with the menacing: “One would be bound to notice. To crack the rotor from the outside, as it were. With scissors, say.” This is a key element in the play. The villagers, and Fisher in particular, are constantly challenging Norah to break the spell and question what is going on, but Norah, whether through fear or something deeper, cannot bring herself to do so. James MacTaggart’s direction also adds to the menace of Bowen’s script. One of the most memorable and enigmatic images in the play features the “half a marble…looks like an eye” that Norah takes into the cottage from her window-sill shortly after moving in. It is implied that the eye has some kind of power over Norah, like the druidic white marble, or the tiger’s eye, but it is all suggestion. There are many subsequent scenes that linger on the “eye” and heavily foreground it, creating a feeling of unease that has no rational basis. 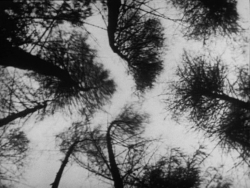 Some of Bowen’s most disconcerting dialogue involves the eye, especially when Norah interrogates Rob, and continually asks: “You can’t think of any reason why I should bring it indoors?…If you found it on your window-sill, would you bring it inside?” MacTaggart also uses stills of dead animals to represent the harvest festival gifts, and accentuates the harshness of the village attitude to sacrificial offerings. This is further stressed when Mrs Vigo graphically eviscerates a hen with the curt comment: “She’m gone broody. No use for laying. Wring her neck, slit her throat, hang her up; it’s all she’m good for”. At this stage, it is clear that her words could easily be referring to Norah’s childless state, and the general contempt that the villagers have for the “modern views” of her London friends. And it is in the use of Norah’s social background that the play shows close links with Bowen’s earlier work. Bowen was originally an advertising executive, and this was the setting for his novel Storyboard, but as he began to have some success as a television playwright he also used that as subject matter. 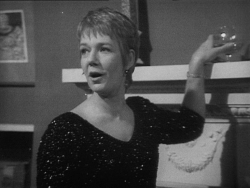 Norah, the outsider in Robin Redbreast, is a television script editor, and indeed, her character previously appeared in Bowen’s 1962 novel The Birdcage; In the novel she is living with her partner Peter Ash, unmarried, and when he makes a decision to end the relationship she is upset but forces herself to see the logic of the situation: “They were not married. They had no children. They were not one flesh; they were independent beings. She had neither a legal, nor a moral claim on him”.4 The setting of The Birdcage is very similar to the London scenes of Robin Redbreast. In the play Norah has also been abandoned by her unmarried lover (again named Peter), but is hardly comforted by her cool and distanced friends, who are entirely at ease with infidelities and are somewhat embarrassed, even panicked, by Norah’s occasional displays of emotion; Jake (a television producer) appears to joke with Norah in front of his wife: “I thought I might make a pass at Norah; I thought, next time you were out of the room, I’d sidle over for a quick cuddle”. However, we realize when the women are left alone that Jake has in fact already made a pass at Norah, and that his wife is largely unconcerned by this. Bowen portrays these characters with a cool eye, and indeed in The Birdcage and others, seems to be mocking the characters’ pretensions to living a life that is free of emotional turbulence. The influence of Greek myth is acknowledged in the play itself, when Norah argues with Fisher that although the sacrifice of Rob is Greek in origin, it is not an English legend (as Fisher states, it is also “Egyptian. Mexican. Many places”). Fisher replies “Always Robin. Such bounty there was, such fruitfulness, Miss Palmer, from the blood that drained from Robin Hood the old stories say. But they are only stories of course”. This and his additional reference to Fraser’s The Golden Bough is also important, because it seems clear that Fisher is drawing together any of the old myths that suit him, and developing a synthesised myth for his own village. Mrs Vigo describes Fisher perfectly when she comments “Oh, he’m a learned fellow, Fisher. You can’t tell what he means”; Fisher is a faintly absurd character; he works for the council, can’t drive a car, and often describes himself in a Pooterish way “The study of religions is one of my many interests. I am a reading man, you know”. And yet he is a terrifying figure because his knowledge of the “old ways”, and more significantly his interpretation of them, grants him power over the other villagers. There is a little doubt that he is the driving force behind the sacrifice of Rob, and that he believes in his role as high priest. In this respect he is strikingly similar to one of the main characters in Bowen’s early novel and stage play After the Rain. This work features a post-flood Britain, and a community of survivors (including actors and advertising executives) who are lead by an insane accountant named Arthur Renshaw. The description of Arthur is very reminiscent of Fisher: “Behind his spectacles, his eyes gleamed with the light of pure intelligence. 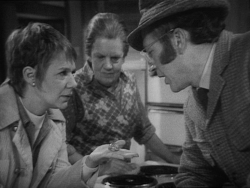 Arthur was like that – absurd and frightening”.7 Renshaw has an irrational hold over the others on the boat, and eventually forms a religion that demands a human sacrifice, much like in Robin Redbreast. It is certainly the case that, in much of his work, Bowen attempts to demonstrate how fragile the Apollonian world-view could be when faced with the irrationality of the Dionysian, but the artistic results were very mixed. 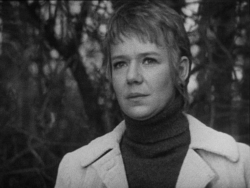 The strength of Robin Redbreast is in his use of the horror genre, and a closed village community that could plausibly still be entrenched in the “old ways”, as opposed to a straightforward modernization of the myth as seen in The Disorderly Women. Robin Redbreast certainly fulfils Bowen’s dictum of a play with “ideas expressed in incident“, although it has to be acknowledged that it is the genre-specific elements which initially hold the viewer’s attention rather than the synthesis of myths and their relation to the modern world. However, it might well be that Robin Redbreast finally managed to resolve his ideas on myth, as he didn’t return to it in an explicit form for his subsequent work. Although it can be risky to read too much into the patterns of writer’s careers, it could be significant that after this play Bowen wrote only twice more for the Play for Today strand, and subsequently specialised almost exclusively in thriller serials and adaptations. In later years Bowen recommended that thriller writers should never have an end in mind when starting their story as “The craft is to hold the attention of an audience by asking and answering a series of questions, and one’s own interest can only be held by finding answers for oneself as one goes along with the characters”.8 Although his later thrillers were often very effective (particularly A Dog’s Ransom adapted for Thames Television’s Armchair Thriller) they lack the resonance and strangeness of Robin Redbreast which holds our attention not just because we are waiting for “answers” but because it demonstrates the power that Fisher’s old tales can still hold over us. Robin Redbreast has subsequently been released on DVD by the British Film Institute (2013). 5 February 2014: added all images. 4 March 2017: standardised presentation of ‘Updates’ legacy information (2003, 2006, 2009) in line with current site practice; removed ‘(first published: 2003)’ from byline as a result.